All transactions are safe and secure with a reliable history in online purchasing behind each of our associates. 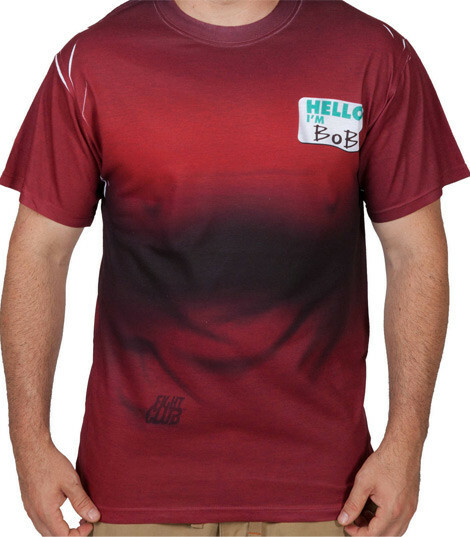 Buy the Hello I'm Bob t-shirt to own Fight Club clothing and merchandise. A humorous choice, this name tag T reads, "Hello, I'm Bob." We encounter Robert "Bob" Paulson, portrayed by Meat Loaf, at support group meetings that Edward Norton's character attends. The Narrator (Norton) learns that Bob has developed breasts as the result of a hormone imbalance from having his testicles removed due to cancer. This Fight Club shirt is a fitting tribute to Bob, as it even shows off his unavoidable assets. In addition to the Hello I'm Bob tee above, browse the Fight Club Clothing Gallery for more apparel like men's and women's clothes, kids shirts or hoodies.